RayBlaster ships with an inspiring library of over 1000 presets created by the world’s top sound designers. Many complex sounds such as arpeggiators, vocals or drumloops automatically synchronize to the BPM. For fast & easy access to the specific sound you desire, all sounds are arranged into categories, making them easy to locate whether for live performance or within a professional studio environment. A comfortable patch browser gives you instant access to a huge sound library with ready-to-use patches. What is Impulse Modeling Synthesis? IMS goes far beyond traditional forms of synthesis. It offers a completely new world of sounds and huge creative potential for modern music. Conventional synthesizers employ what is known as ‘subtractive synthesis’: An oscillator plays a looped waveform that is passed through a filter to shape the sound. By contrast, RayBlaster2 utilizes an entirely new and radically different approach to sound generation. It creates its distinctive sound by combining many short bursts of energy to form a complex sound. In fact, this innovative approach to synthesis is very close to how our human inner ear perceives sound. 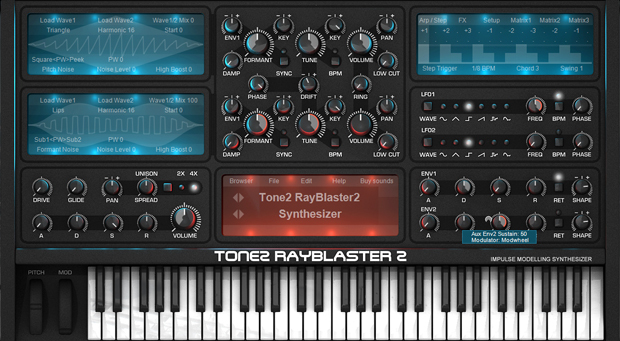 Because of its innovative method of synthesis, RayBlaster2 offers a wide range of unique sounds, which can’t be created by other synthesizers. We recommend that you download the free demo version of RayBlaster2 to convince yourself! Spice up your tracks with exciting movement! Do you want to use the LFO to wobble your sound? Simply drop it to a knob and you’re on your way. Modulation can be as simple or complex as you want it to be. By using drag&drop or the modulation matrix, RayBlaster2 allows you to connect dozens of modulation sources to all important sound parameters. Modulate almost any parameter, well into audio-rate speed, from internal modulation sources like LFOs, punchy envelopes, step sequencers, and a wide variety of MIDI signals. We’ve also included midi-learn, so assigning CC’s is as simple as a right-click. RayBlaster2 comes with a huge variety of effects that were developed and fine-tuned to complement RayBlaster’s Impulse Modeling Synthesis. 44 different stereo effects are included, all carefully crafted to offer the highest quality possible: A large variety of Reverbs, Delays, Chorus, Ensemble, Phaser, Flanger, Rotary, Compressor, Amp-Sim, Equalizer, Surround-Encode, TranceGate, Resonator, Hypersaw, …. In addition to importing filter characteristics into RayBlaster’s oscillators, you can also import the waveform of any other synthesizer into RayBlaster2. This gives you an unlimited number of possible waveshapes, all of which are capable of being morphed in real-time. You can resynthesize short samples like a drumloop or a vocal phrase. 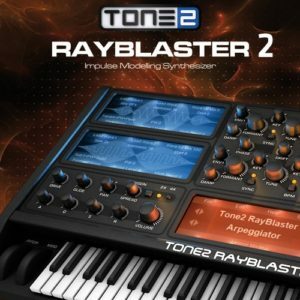 RayBlaster2 also offers many possibilities to synchronize complex sounds to BPM as well as providing the ability to manipulate the pitch, timing and the timbre of all your sounds in real-time.